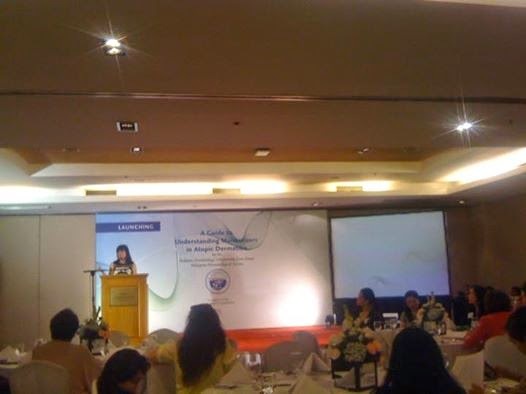 The Pediatric Dermatology Subspecialty Core Group of the Philippine dermatological Society (PDS) has launched “A Guide to Understanding Moisturizers in Atopic Dermatitis” in the A. Menarini Philippines Media Briefing held at the EDSAShangri-La Hotel last April 1, 2014. The said handbook for Filipino physicians contains a review of published scientific articles on local moisturizers, efficacy and its mode of action. Atopic dermatitis (also called atopic eczema) is long-term, relapsing skin disorder characterized by scaly and itchy rashes. Sometimes called as “asthma of the skin,” this chronic disease is caused by a reaction in the skin similar to an allergy. The reaction leads to swelling and redness which maybe severe. Scratching the rash can make it even itchier and cause more inflammation. And once the skin barrier is broken by repeated scratching, the skin can become infected by bacteria. Atopic dermatitis is most common in infants and may start as early as 6 months of age. Though it usually begins during infancy, it is more prevalent among children aged below five years old. Many people outgrow it by early adulthood. Treatment for atopic dermatitis depends on the type of rash which may appear as red to brownish-gray colored patches. Most mild eczema cases can be treated at home with skin barrier repair moisturizers and preventive care. “To date, no single reference on the use of moisturizers in atopic dermatitis is available for doctors in the Philippines. We are pleased to work with A. Menarini Philippines in developing ‘A Guide to Understanding Moisturizers in Atopic Dermatitis,” said Dr. Maria Victoria Dizon, Chair, Pediatric Dermatology Subspecialty Core Group. “We congratulate the Pediatric Dermatology Subspecialty Core Group of the Philippine Dermatological Society for creating an evidence-based, handy physicians’ reference that will be a big help in easing the pain and discomfort of Filipino children suffering from atopic dermatitis,” said Dr. Maria Carolina De Quiroz, Medical Affairs Director, A. Menarini Philippines. “We are honored to support the development of this very timely handbook. A. Menarini Philippines is committed to work with Filipino physicians in continuously improving the quality of Philippine healthcare,” said Ninia Torres, General Manager, A. Menarini Philippines. Atopiclair™ maybe used as a monotherapy in mild atopic dermatitis or in combination with other treatments for moderate to severe symptoms. Atopiclair™ is specially formulated with key ingredients that work synergistically to help keep the skin moist by repairing the defective skin barrier and reducing TEWL (Trans EpidermalWaterLoss). It is also anti-pruritic and therefore reduces itch commonly experienced in atopic dermatitis.